This year, The UK VC Partnerships Group working alongside JISC (UK) held their National Awards Ceremony from the Bett Show at the Excel Exhibition centre in London on Wednesday 25th January. The winners from across the education sector showcased what they have done for teaching and learning using video conferencing to win their national accolade. Richard Sedding, Chair of the group, alongside other members from all over the UK joined the ceremony to see the winners awarded with their trophies from former minister for education, Lord Jim Knight, Chief education adviser for tes.com. This award submission reflects how Churchfields Junior School through the Redbridge VC network makes links both nationally and internationally, enriching our geography and science curriculums and forging relations with schools around the world. Perhaps our most exciting project so far has been with a school in Brazil during their hosting of the Olympic Games. Year six pupils from Churchfields ran their own project supporting the teaching of English to Brazilian children. This project was run by the children and they prepared detailed lessons in their own time. As a whole school, we were also able to share song (in native and foreign language) and dance with this school and to benefit from the same display from them. Elsewhere in the school we have been able to connect with the National Space Centre, allowing pupils to find out new facts about planets in our solar system. This enriched the science curriculum in year five, allowing children to interact personally with members of staff at the space station. Children also had a conference about Salt Lake City looking at archaeology and fossils and about another about rivers, complementing learning in geography. We have also benefited from our school choir connecting with Manhattan School in New York to exchange the singing of Christmas songs. Junior Travel Ambassadors at the school have also benefited from video conferencing. This elected pupil voice group delivered a presentation to Keith Prince (the Havering & Redbridge Conservative member for the London Assembly). In year four, children are currently using a link with a Brazilian school to present a lesson each week on life in our country and vice versa. This complements their learning in geography which is about this South American country. We are very proud that Churchfields has travelled a total of 317,000 miles in the last year. Meaning that as a school, we have travelled around the world over 12 times in the last 12 months. For the third consecutive year a Redbridge school has won the prestigious National UK Video Conferencing Award. Congratulations to Ilford County High School, who were the winners in the Secondary School Category. Ilford County High School received their award from the UK VC Partnerships Group working with JISC (UK). The National Awards were streamed live across the internet at 3.30pm on Wednesday 13th May 2015. The winners from across the primary, secondary and HE sectors showcased what they have done for teaching and learning using video conferencing to win their national accolade. Ilford County High School have travelled over 10 thousand virtual miles over the last year with most of their 900 students being involved in at least one virtual journey, from Global energy debates with Hong Kong to GCSE Astronomy lessons with the National Space centre. These experiences would not be possible without the video conference equipment and connecting through JISC. 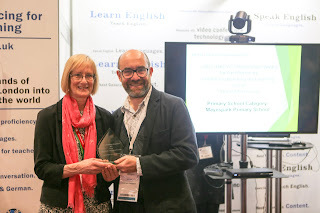 Highlands Primary is this year’s winner of the The National Janet (UK) Awards for Excellence for enhancing teaching in learning through using video conferencing. Highlands was awarded national recognition because of the large number of content providers the staff and pupils had connected to, showcasing time and money saved, within just 18 months. 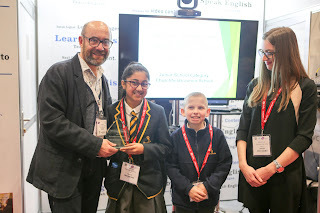 Oaks Park High School in the London Borough of Redbridge have won a Janet Video conferencing Award for the “Best Example of Enhancing Learning”. OPHS have worked on many international, national and local VC projects and events. They have carried out over 100 conferences. Linking to Antarctica, Parliament, London 2012 Paralympians, Philosophy and Economics A-level tutors to name a few. They have made VC partnerships with schools all over the world including USA, China, France, Spain and Canada. OPHS have brought authors into the classroom and shared links via VC with schools locally and regionally – click here to read more. The award was presented to Ms Hayes, Learning Resource Centre Manager pictured below with and Mr Hawthorne, Assistant Headteacher of OPHS, at the National Space Centre in Leicester by Anu Ohaj, Director of Education and Nic Damon from Polycom who sponsored the awards during the Janet 2012 VC User Conference.